Stainless steel worktable surface has curved edges for safety and comfort. It incorporates a heavy duty adjustable galvanized under shelf and leveling feet. AmGood Supply prides itself of being a one stop shop for all of your restaurant supply needs. 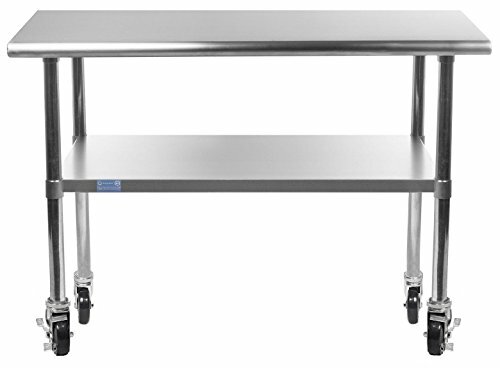 AmGood Supply offers a wide selection of stainless steel work tables with galvanized legs and undershelf. All work tables are made with T-430 18 gauge stainless steel, designed to be easily assembled, and are NSF approved. Stainless steel work tables are commonly used for food prep in a commercial kitchen, as a work desk, assembly line table, work bench, and in many other residential, commercial and industrial applications. The work table is designed to be assembled by one person. Assembly should take 10-15 min. Yes, a set of screws and a wrench are included in the order.